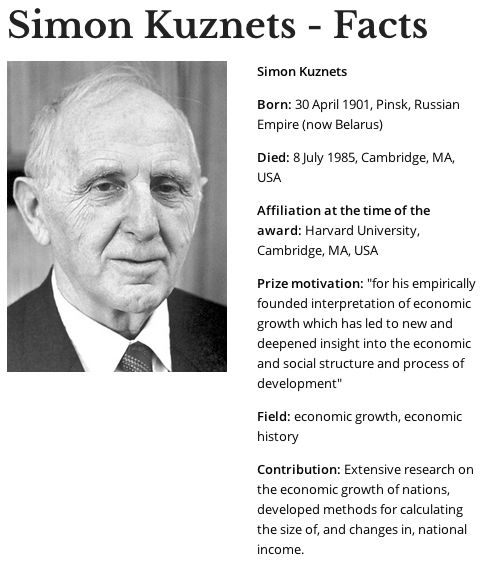 The Sveriges Riksbank Prize in Economic Sciences in Memory of Alfred Nobel 1971 was awarded to Simon Kuznets. Kuznets was awared the prize for "for his empirically founded interpretation of economic growth which has led to new and deepened insight into the economic and social structure and process of development". Even though Kuznets was awarded the prize for his work on economic growth, he had previously applied his knowledge and expertise in statistics to further develop and standardize the various accounts, that as a whole, measure GNP (the total market value of all final goods and services produced over a specific time period by a country's residents). To be specific, Kuznets focused on National Income, which is closely related, if not, practically equal to GNP. 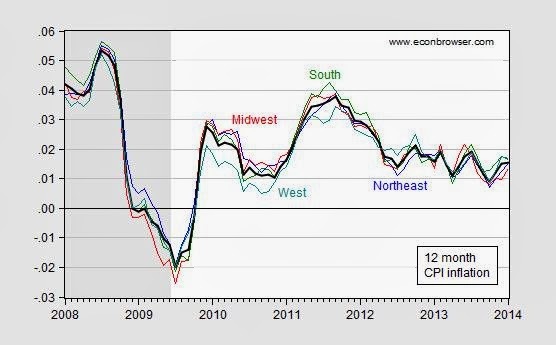 Note: GNP was the lead aggregate measure for national income and output until a few decades ago. Before Kuznets, the methods used to analyze national income and output were, by some accounts, less meticulous and comprehensive - and while Kuznets did not invent the GNP yardstick (a common misconception), he certainly heralded a new era of national income measurement, and spearheaded quantitative-based efforts to further define it, through its intricate bits and pieces. Kuznets went so far as to attempt to include unpaid housework as part of the GNP, but was discouraged, and eventually forbidden from formalizing this initiative. The people behind the initiative mean well. They end the video by saying "...[this is meant] not to replace GDP, but to complement it." The Social Progress Index has produced interesting results. One piece of information that struck me as interesting was the US's relatively low score on "Health and Wellness", despite their increasingly high spending (per capita) when it comes to healthcare. No wonder Obama wants to solve this issue, but has apparently failed to devise a proper solution, according to most Republicans. Michael Porter, a leader in anything and everything related to competitive strategy and the man behind the Porter five forces analysis, is the organization's advisory board chair and one of its main proponents. His support, as well as his colleagues' and fellow leader's backing, will certainly bode well for the future of the GNP/GDP measurement. The underlying result that comes from proper measurement is a fitting way to analyze economic results, and thereby propel economic growth. Kuznets' genius in the matters discussed here was twofold: he (i) devised a better and more complete way to measure the national product and (ii) found a superior method to determine growth analysis - his accomplishments in the economic field were such that he was able to find different ways of enhancing this particular area of study (growth via measurement) - relating distinct facets of the national and global economic engine, resulting in impressive findings and conclusions. One such finding, as presented in his paper "Economic Growth and Income Inequality" went on to explain how economic growth in emerging markets increases income inequality between the nation's affluent and its poorer population, as opposed to reducing it, as happens in more developed countries. In the end, Kuznets revolutionized these specific areas, as well as the overall quantification and scientific based thinking that was becoming all the rage amongst economic circles after the World Wars. He laid the foundation that his colleagues and students benefited from, and was a defining factor in official government statistics and economic reporting. 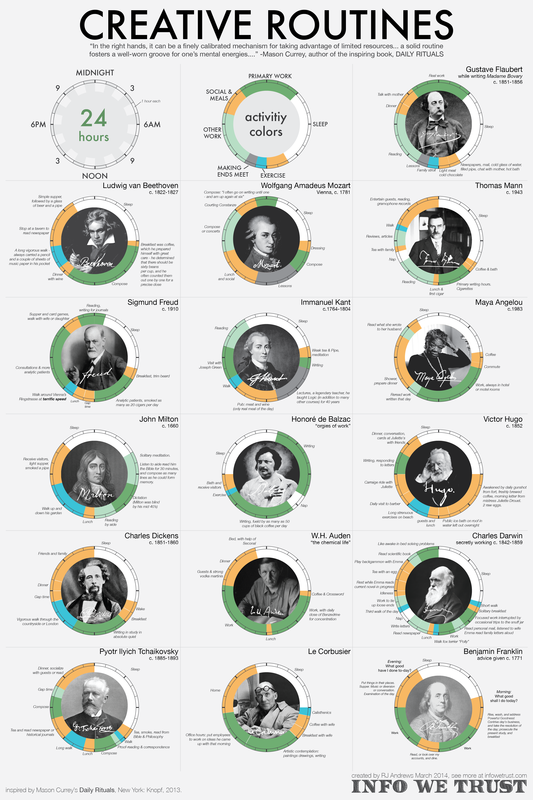 From Shane Parrish's most recent Farnam Street blog post - a great video, featuring great words, from a great scientist.